Here is a sneak peek of some of the new designs and tools from the 2012 Occasions mini catalog. This is a hybrid card that combines digital designing and traditional card making techniques. The Christmas Wishes image and coloring is digital. 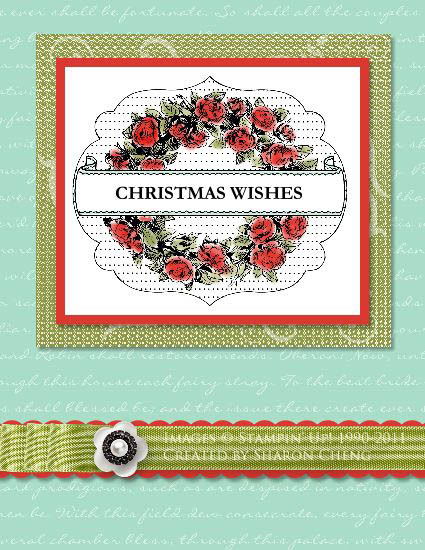 I used the My Digital Studio version of the Apothecary Art stamp set. I copied and pasted so that I could print 9 images on one 8 1/2 x 11 sheet of Whisper White card stock. Each image is then die cut using the Labels Collection Framelit and Big Shot. 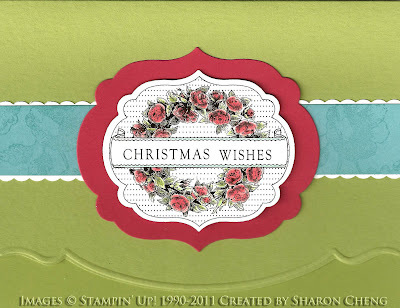 This is the first card that I made with the Apothecary Art Stamp brush set. This card is 100% digital. 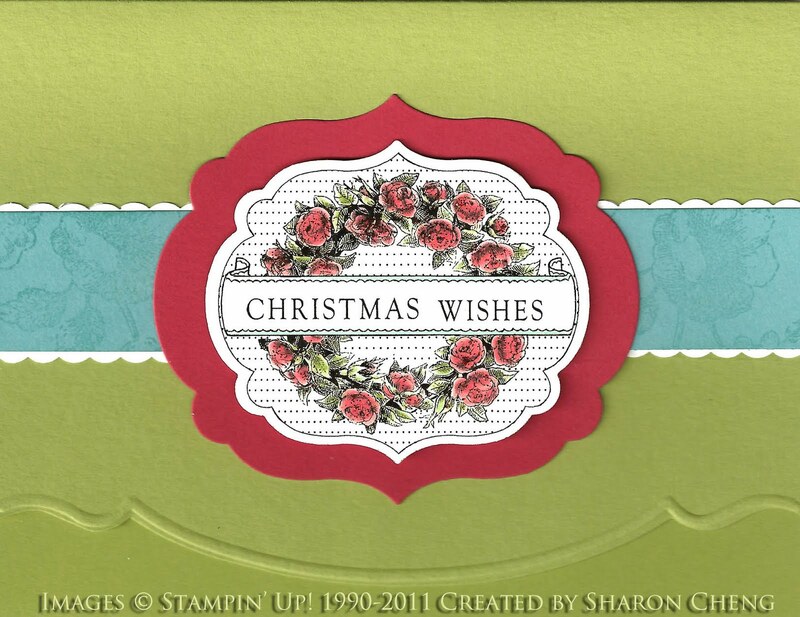 You can more details about how I made this card in my December newsletter. One thing I missed when making the digital card was using the coordinating Framelits dies. The nice thing about the Labels Collection Framelits is that there are a total of 6 labels in different sizes so you can make coordinating mats. And the Apothecary Art images are designed to fit the Labels Collection Framelits. There are two things that don't show up well in this photo. One is that I've used our new Cherry Cobbler Dazzling Details on the roses to give the card extra bling. The other is the bottom edge of the card front. While you can see the embossed impression from the Adorning Accents embossing folder, you have to look carefully to see the coordinating cut edge. For that edge, I used the Adorning Accents Edgelit Die. One advantage of the Framelits and Edgelits is that these dies let you see exactly where you're placing the design before you cut the card stock. As a Stampin' Up! demonstrator, we can pre-order items from the new catalog one month ahead of time. Otherwise, the items in the catalog are available to order starting January 4th. If you would like a copy of the Occasions mini catalog, please contact me at sharon@sharoncheng.com.